This is my drawing of shrimp sushi. 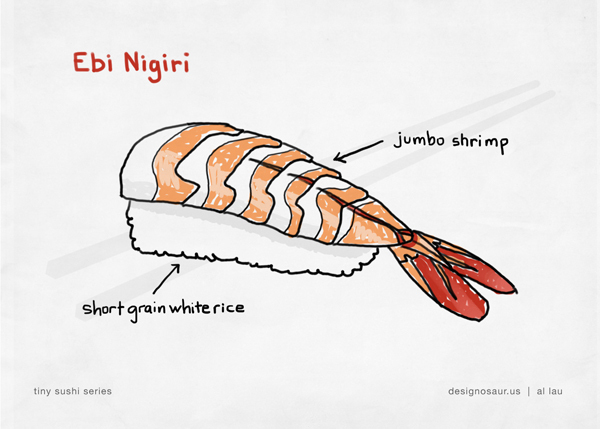 Ebi Nigiri is another easy to make sushi. All that is needed is headless Black Tiger shrimp, or any type of jumbo shrimp, and sticky short grain rice. Remove the shell, but keep the tail on. Use bamboo skewers to straighten the shrimp, then boil until they turn a bright orange. Stop the cooking process by dipping the shrimp into a bowl of ice. Add salt and a squeeze of lemon. Lastly, butterfly the shrimp on the bottom and lay onto the rice. Easy! 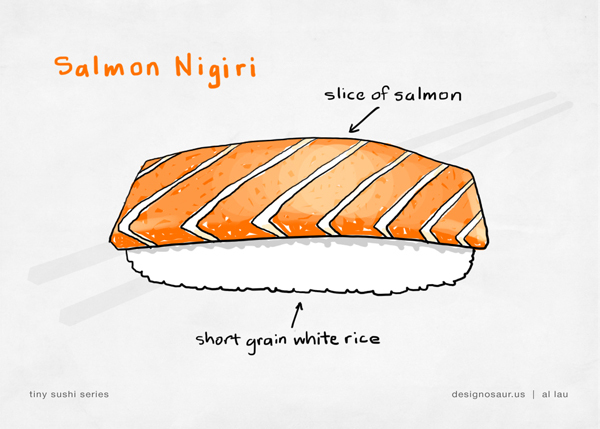 If you want to make sushi at home and impress your friends, Salmon Nigiri could be the easiest to do. No rolling required. Just have a sharp knife to slice salmon and lay it over sticky short grain rice, seasoned with vinegar, salt and sugar. It’s important to freeze the salmon over night, approximately 16 hours, before thawing the next day, and preparing to eat. Freezing kills off impurities in the fish. Or simply ask your fish market that you want to make edible raw sushi, and he/she will give you “sushi-grade” salmon. This is my little sushi drawing. Doesn’t it look delicious? It is coincidental that this post has California in the title (like my previous post). Nice segue huh? But this time, I’m on a foodie kick, and hungry. 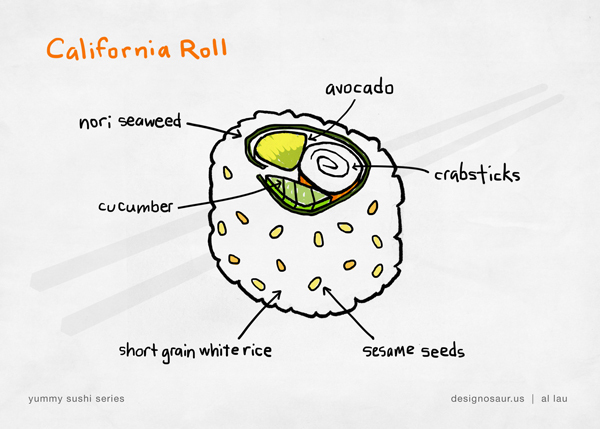 California rolls are a nice introductory sushi for newcomers to the delicacy because there is no raw fish in it. It has imitation crab sticks, which is actually the processed meat of whitefish, or Alaska Pollock, to resemble the look, feel and taste of crab leg meat. And yes, in the process, the whitefish is cooked. So go ahead and try it, if you haven’t already. Then, be more daring by trying one of the raw fish sushi’s, next time. Which is your favorite sushi?